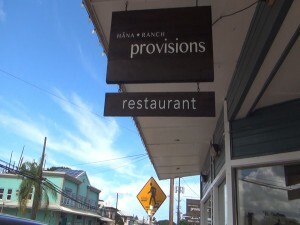 Hāna Ranch Provisions opened in Pā’ia back in August of 2015, with a mission to grow not only food, but also awareness about the company’s important role as stewards of the land and supporters of the local economy. But a little more than a year later, structural issues in the 106-year-old building at 71 Baldwin Avenue forced the restaurant to shut its doors. At the time, the closure was temporary. But Provisions leaders say as Fall turned to Winter and repairs continued, it became clear that the doors would have to remain closed, permanently. Executive Chef Gary Johnson says other potential restaurant locations were researched, but for the time being, Hāna Ranch will put energy into its grass-fed cattle ranching operations on an impressive 3,600 acres, and focus on the food truck. 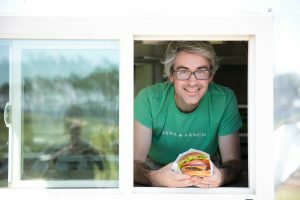 It’s partnered with Maui Preserved in Ha‘ikū to rent commercial kitchen space for its Hāna Burger Food Truck, located at the ranch in Hāna. 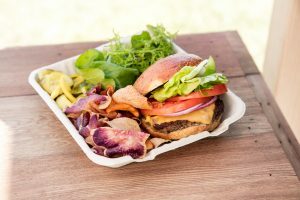 Fresh offerings from the Hāna Burger food truck. Courtesy photo. Morgan Maki with Hāna Ranch. Courtesy photo. 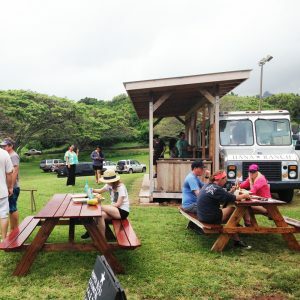 Hana Ranch Food Truck Grand Opening. Courtesy photo. Since the organic produce was primarily grown for Provisions, the ranch has scaled back its farming efforts. 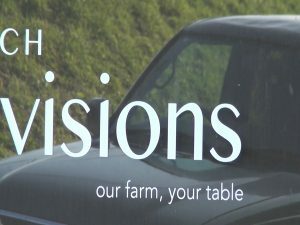 While it will still continue to provide for the food truck, Johnson says greenhouses have started to go out of operation, and orchard management has become a bigger priority. “We have a few acres of breadfruit trees that are starting to mature, we also have a papaya grove and bananas and other fruit trees,” he explains. Hāna Ranch Provisions staff members thank the community for its outpouring of support. 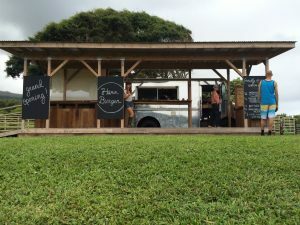 Learn more about the food truck and company at the Hāna Ranch website .